Lovely, what sort of bird? So pretty! 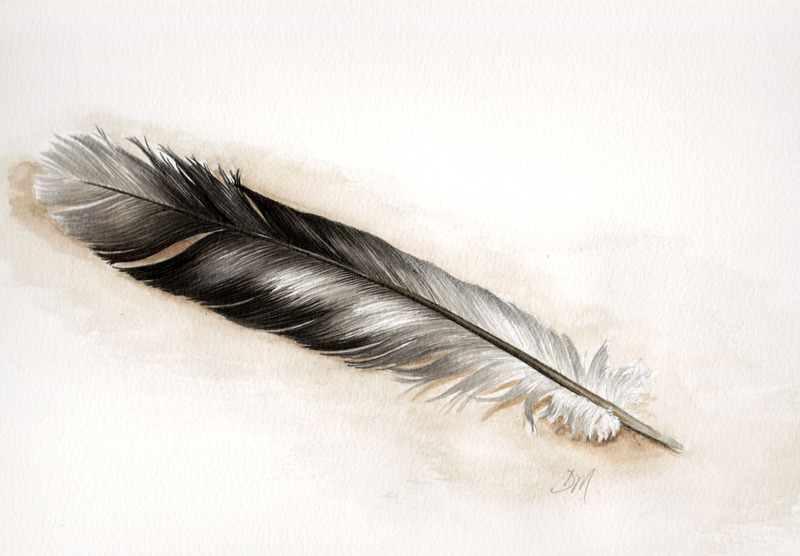 The drawing even shows that feather sheen. Simply stunning Debra. The details are incredible. My mouth is hanging open in awe. The feather is so detailed yet very soft looking--just like a real feather. Lovely. I like your work alot. Thats really lovely, and so well made.. I just love the top part of it, it almost looks like you could pick it up. And I love the colours of teh whole picture. Beautiful!!! Looks like it can be picked up - how long does something like this take you? There is so much attention to detail I have a mental image of you sitting up to the wee hours toiling away with a pencil sharpener and oil lamp. So soft looking, just like a real feather! That's beautiful, Debra. You really nailed the texture. Wow! This is beautiful! =) Not sure how you're able to bring out the fluffiness of the subject, but you have definitely pulled it off in an elegant manner. I’ve enjoyed catching up with your blog after my holiday,these feathers are great as is the sushi. Totally stunning , such precision and skill ! Doing a little catching up on your blog today...beautiful as always! I drew a feather my husband found while I was away...didn't look anywhere near as goop as this!